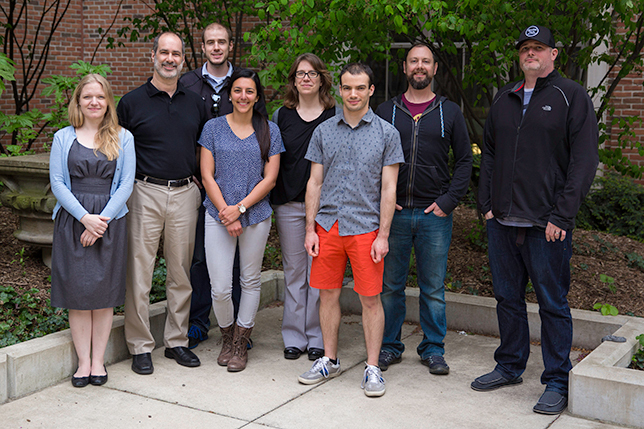 The University of Michigan GradeCraft team (left to right): Caitlin Holman, Barry Fishman, Adam Levick, Marie Hooper, Rachel Niemer, Ben Plummer, Jonathan Gabel and Jamie Wright. Many universities are experimenting with adding elements of games to courses. But at the University of Michigan, faculty members and researchers draw a subtle but crucial distinction between "gamification," which may add a layer of fun to a typical activity, and "gameful," which seeks to fundamentally change the nature of teaching and learning so that the progression through a series of activities is more engaging. "School is a kind of game — just a poorly designed one," said Barry Fishman, a professor of learning technologies in the UM School of Information and School of Education. "Typical grading systems create learners who are trained only to follow rules and pay attention to their grades, the 'final score' in their courses." In contrast, well-designed games spark players' curiosity, hold their attention, teach complex skills and get players to persist through ever-increasing challenges. Fishman's goal: to transform the grading system in a way that helps students focus on learning, not grades. As the effort to bring the qualities of well-designed games to pedagogical assessment spread on the UM campus, it engendered the creation of a new type of learning management system called GradeCraft. GradeCraft borrows game elements such as badges and unlocks to govern students' progress through a course. With unlocks, for example, you have to complete a task before moving to the next level. "You might have a final project worth a lot of points in the course, but not just anybody can do it," Fishman explained. "You have to qualify for it by demonstrating that you are ready for it by completing other activities first." Before GradeCraft, Fishman and a few other instructors were experimenting with gameful elements in their own courses, and found that it was difficult to keep track of where each student was in the process. "We had lots of spreadsheets going, lots of tracking mechanisms to figure out where people were and what they were doing. But in the end, if you don't have good information about where you are, that is not a good way to support autonomy or competence," he said. That is when graduate student Caitlin Holman came up with the idea of developing a software program specifically designed to support the instructors who were implementing gameful learning. "She is the main force behind the design and research of GradeCraft," Fishman said. Written in Ruby on Rails and hosted on Amazon Web Services, GradeCraft was created by a small team of students and faculty with additional software support from Ann Arbor-based developer Alfa Jango. Their work received support from UM's Office of Digital Education and Innovation and the Office of the Provost. GradeCraft can work as a stand-alone platform or in conjunction with a traditional LMS via the LTI (Learning Tools Interoperability) protocol. The system launched on UM's Ann Arbor campus in 2012 and went into broad use by winter 2015. In the most recent semester at UM, 29 instructors used GradeCraft for 58 courses across 17 disciplines. Here is how it works: Instructors create a course shell within GradeCraft (similar to the process with any LMS). Students use a tool called the "Grade Predictor" to plan a personalized pathway through the course, making predictions about both what they will do and how they will perform. When assignments are graded, predictions turn into progress; students are then nudged to revisit their semester plan, reassessing what work is available and how well they need to do to succeed overall. Students are able to independently choose an assessment pathway that matches their interests within the framework of learning objectives for the course. 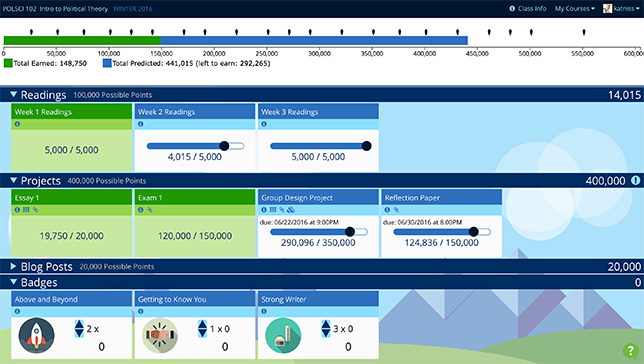 GradeCraft's "Grade Predictor" tool helps students plan a personalized pathway toward their learning goals, making predictions about both what they will do and how they will perform. Students also have access to detailed analytic displays to help them gauge their current (and planned) progress through the course, including data on how their performance on particular assignments compares to the rest of the class. Instructors receive detailed analytics on learners as well, allowing for early identification of struggling students and also tracking and comparison across sections, which can be handy when you are managing a team of graders. One of the principles behind the gameful work is self-determination theory, which argues that when people 1) feel that they can make choices that matter, 2) feel connected to others and 3) believe their current level of competence is important and they are able to build competencies, they feel more motivated and engaged. Those are characteristics that well-designed games and well-designed learning environments happen to share, Fishman said. "So our real mission is to support instructors in redesigning their learning environments to support those three things." Fishman admits that embracing gameful learning and GradeCraft is challenging for instructors, because it means making deep changes to the assessment system of a course. For instance, instead of a course grading "out of 100 percent" or on a curve, all learners start with zero points and earn their way toward their course goals, he explained. A community of practice at UM works with instructors to help them clarify their learning goals and identify the range of ways students in their class can demonstrate progress toward and/or mastery of those goals. "There are a number of technologies that automate what you do or make it easier. They help you do things better," he noted. "This is a technology that enables you to do better things. But in order to do it, you have to be mindful about your teaching and do some redesign. We are using a learning community model where instructors get together monthly and discuss what we are doing." Leading that learning community is Rachel Niemer, director of digital pedagogy and learning communities at UM. She said that for some instructors, aligning their assessments with specific learning objectives is a new experience. When they try to create multiple pathways through a course, they need to make sure students are exposed to and assessed on similar or analogous content. "So we work with them to generate ideas on equivalent assignments to match up with a traditional exam, and think about how else a student can demonstrate they have mastered content," she said. Niemer added that instructors get excited about using unlocks because it allows them to think about student competency and mastery more than they do in traditional assessment. One stumbling block for gameful teaching and GradeCraft is some established thinking about the purpose of grades and grading, Fishman said. For some university instructors, grades are a necessary sorting mechanism; if all students can earn an "A," they believe the class must be too easy. Fishman said he prefers to think that courses should be extremely challenging, but that it should be possible for everyone to earn a high grade. When one grades "on the curve," he pointed out, positive outcomes are rationed, and true performance is hidden behind a force-fit distribution. UM is starting to do research into which gameful elements are most effective at fostering student learning, engagement and intrinsic motivation. According to Fishman, early findings suggest that many students in gameful courses engage with content more deeply and intensely than they otherwise would. Some students who have taken courses with GradeCraft report that they now approach all of their courses with a new perspective. In a focus group, one student said that taking a gameful course helped him recognize that there are two objectives when he is taking a course: getting a good grade and learning course content. He noted that the realization that grades and learning aren't inextricably linked allows him to aim to maximize both objectives, and when they are in conflict, be strategic about how he approaches his coursework in order to meet his own personal goals. The project has drawn interest from other campuses as well as K-12 schools. The GradeCraft team has developed a website to showcase the technology and is working on a MOOC and possibly a conference on gameful pedagogy. They expect to launch a commercially available hosted platform in the next year. "I anticipate that there will be a broader community thinking about this," Niemer said. "We have noticed that most of the instructors who first came into the community were award-winning instructors. As people begin to realize there is really good pedagogy embedded in this, we'll see another spike in interest."